From our smart phone’s global positioning system to emergency vehicle response and urban planning, geographic information systems, or GIS, is the future of everything spatial. On Sept. 6-7 at UC Berkeley, almost two hundred leading researchers and students from 24 organizations came together to focus on the application of remote sensing and geospatial analysis to address issues of poverty, sustainable development, urbanization, climate change and economic growth in developing countries. With more than 100 people on the waiting list, the symposium attracted participants from all over the country and outside the US, organized by the Big Pixel Initiative at UC San Diego, the Center for Effective Global Action (CEGA) and the Geospatial Innovation Facility (GIF) at UC Berkeley. “We wanted to bring together data scientists, geographers, social scientists and economists to learn from each other, brainstorm together and come up with new and novel research methods that will allow us to address the most persistent challenges of our world,” said Goldblatt. The collaborative gathering launched with a symposium showcasing scientific presentations and posters from more than 36 leading researchers including GPS’s professor Gordon Hanson, assistant professor Jennifer Burney and conference organizer Goldblatt. Aimed to expand the reach of remote sensing applications to faculty, graduate students and tech companies, the workshop was divided into three main themes: Climate, Agriculture and the Environment, Measuring Urbanization and Human Settlements, and Economic Growth and Development. Professor Hanson’s presentation demonstrated the power of remote sensing for the analysis of economic development. By exploiting high resolution satellite imagery spanning two decades, researchers were able to map the effects of the “Golden Quadrilateral” in India on the country`s economic development. The project illustrates the power, accuracy and cost effectiveness of this approach for economic geography research. Assistant professor Burney’s talk took the discussion from urbanization to agriculture. Remote sensing can be used to monitor the encroachment of semi-arid conditions into once-fertile farm land. A more granular use of the technology allows for the analysis of season vegetation patters, which can be used to maximize investments and protect against shocks. Lastly, Burney highlighted how remote sensing can be used to evaluate agricultural practices such as land titling and conservation agriculture. Speaking alongside his GPS colleagues, Goldblatt presented on mapping urbanization processes in Vietnam, one of the densest countries in the world. 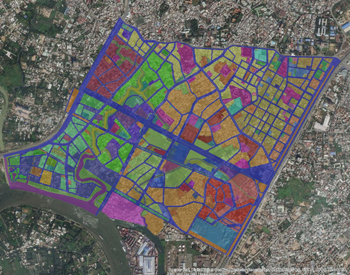 Looking at the added value of Sentinel satellites for urban research, the study used Google Earth Engine to look at land cover and land use change, finding remote sensing techniques to be effective at mapping population and land cover change. “The remote sensing scientist, together with the data scientist, has the skills to map and interpret the data. The economist knows how to use this data to understand economic relations, and the social scientist can relate the physical dimension to social networks and patterns. This is what is exciting about science, and this is why I think this conference was a success,” said Goldblatt. During the second day, a geospatial-data workshop was held, providing introductory training from academics and tech-sector partners in the use of new tools, data and platforms for geospatial analytics. The revolution in geospatial data has the ability to transform how we map and understand our world, in real time. Visit Storify to see a recap of the conference. 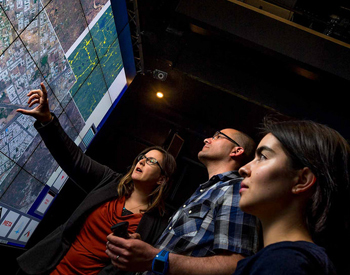 Led by Hanson and Albert Yu-Min Lin of the Qualcomm Institute, the Big Pixel Initiative’s mission is to develop advanced geospatial capacity to address the world’s greatest challenges, developing tools in computer vision, machine learning, GIS, remote sensing and crowd sourcing.